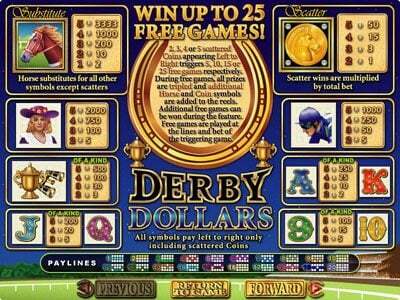 Derby Dollars online slot machine pictures and slot feature list from RTG, play Derby Dollars Slots for free. Derby Dollars Slots 5 out of 5 based on 4 ratings. 4 user reviews. 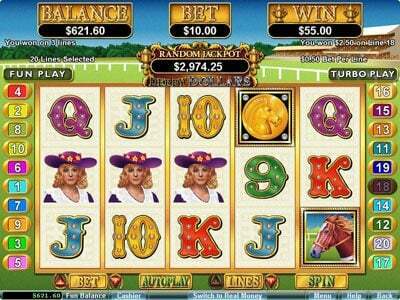 Derby Dollars is a 5 reel, 20 line horse racing themed video Slot from Real Time Gaming. 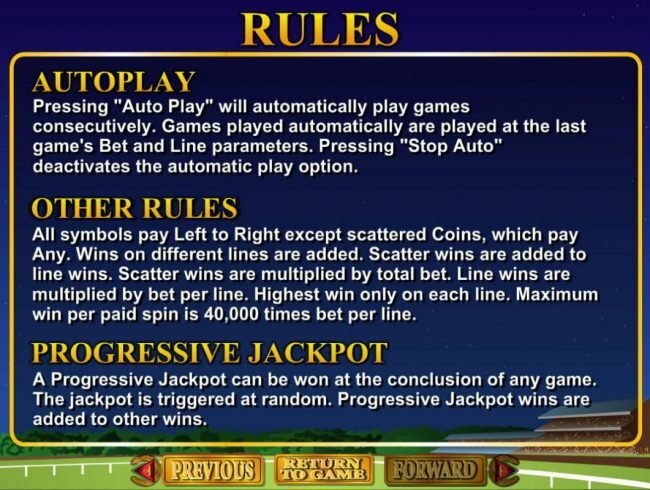 It includes scatter symbols, wild symbols, Free Spins and a progressive jackpot. The world of horse racing is brought to you with images of the track in the background as it overlooks the lush forest and green fields that the track operates on. The stands are seen to the right and the progressive jackpot is surrounded with the gold trophies that the riders race for. The simplicity of the slot symbols is what makes this slot attractive. They have been created to resemble some of the people and things you would find at any respectable race and give credibility where it is deserved. Those symbols include a gold trophy, black and brass binoculars, a horse jockey and a class lady with her wide brimmed hat. The Bonus feature symbols include the horse and the gold coin. 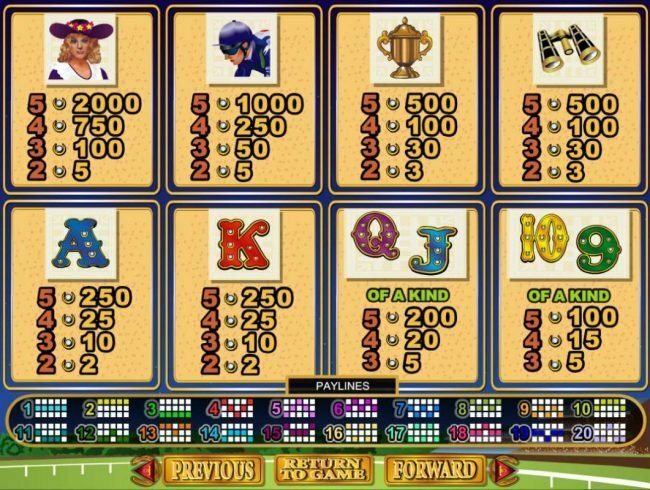 This is complemented by the standard slot fillers like letters and numbers. You will find a nice range of coin size that can be used. This starts at 1 cent and increased to $1. RTG Slots only allow for single coins to be played per line so that makes the top wager in Derby Dollars $20. All the usual controls are available including sounds and speed and well as autoplay options. All of which will add to your ability to play the game as you like it best. 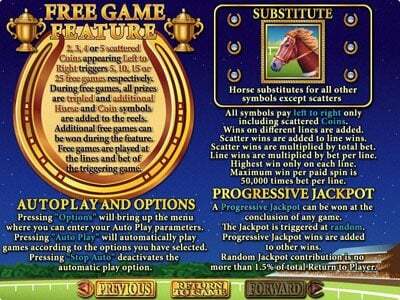 The horse offers you a coin win and also will be the wild symbol. 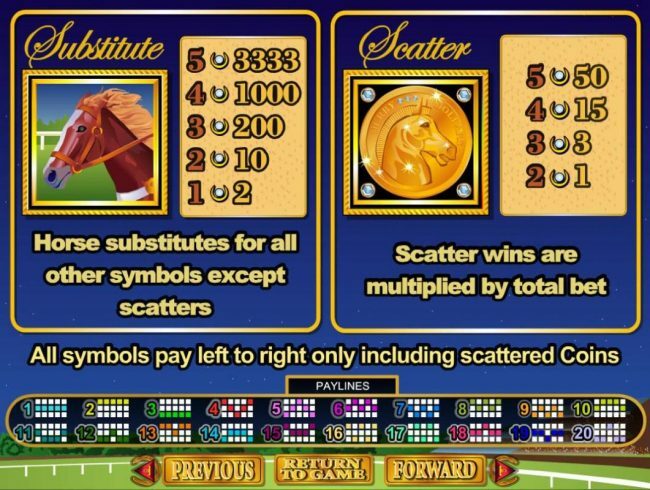 When it appears on the reels it will match any other symbol to complete winning combinations except the scatter. Getting 5 of the horses will return a win of 3333 coins for your efforts! 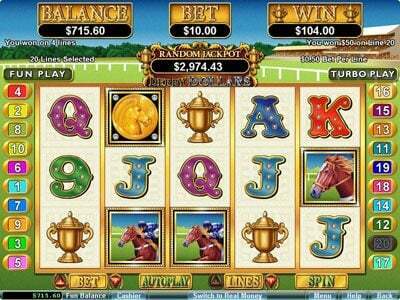 Four of the lovely horse will pay 1000 coins, three will award 200 coins and two will pay 10. The gold coin is the scatter in Derby Dollars. It will award a scatter pay once two appear on an active payline. This awards a win of 1 times the wagered bet. If three appear a win of 3 times will be applied, four will apply 15 times and five will apply a win of 50 times the triggering wager. It will also begin to award free spins once two gold coins land from left to right. If you find then 5 spins are own, 3 will see 10, 4 will award 15 and5 will award 25 free spins. All wins will be tripled and the free spins can be triggered again while the original free spins are being played. If at the end of a spin you are lucky to see light flashing and bells going off then you will have won the random progressive jackpot! Be sure to play this horse lovers game today and go for a first place finish! Do not use more than one no deposit Casino promotion as they may not pay you for not following the rules. 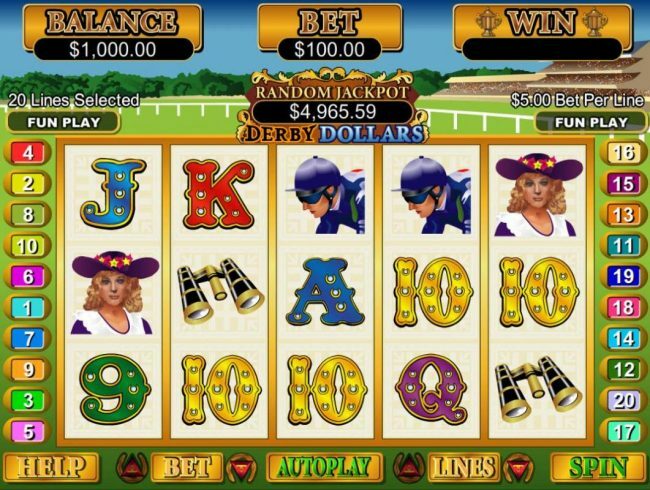 Derby Dollars is a fun video slot to play. Whether your into betting on the horses or not, it is sure to please the horse lover in you. The payouts aren't the best, but it will keep you wanting more. Do you love the horse races? If so, Derby Dollars video slot is a game full of betting enjoyment. With free spins you can win up to 25 games and 3x multiplier. 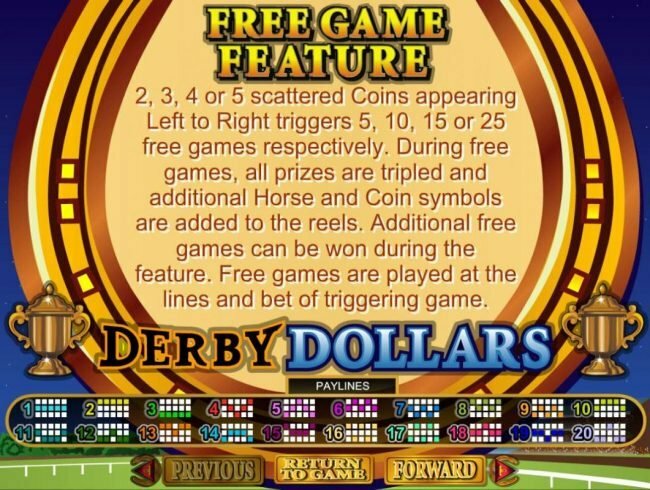 DERBY DOLLARS is a olddie but a goodie!Your off to the races in this game get three golden horses and that starts the Free Spins.In the bonus round you can retrigger the Free Spins over and over..its a blast ,,give it a shot and soon your be the winner of the race!